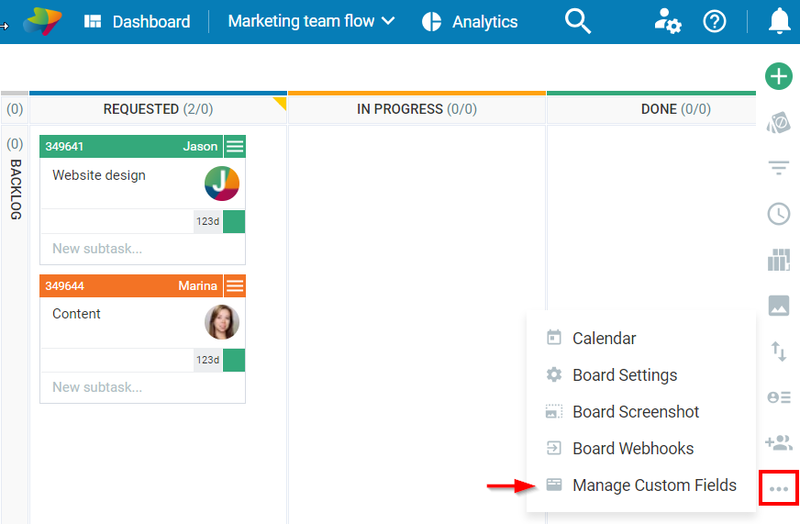 The Custom Fields management is now available at the Board interface. Users can create, add, remove and make custom fields mandatory directly from the board they have currently opened. 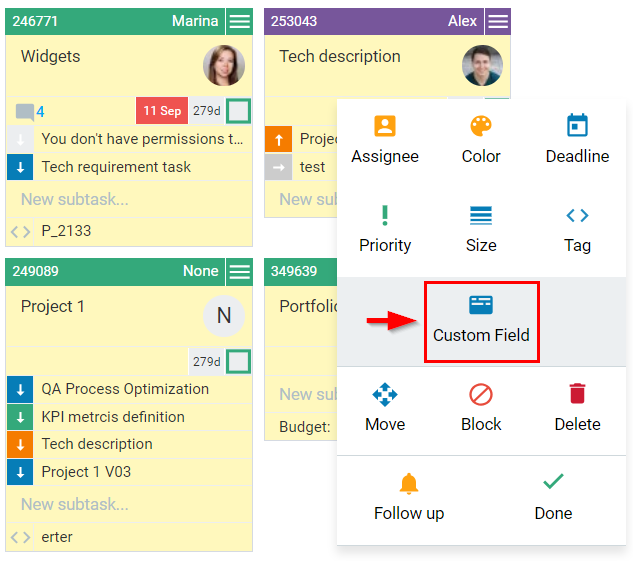 To access the Custom field management panel, click More Options (the three dots icon) on the Board Sidebar and select "Manage Custom Fields". It provides access to all custom fields currently available in the collection of boards, which belong to the Workspace. Click the toggle button to approve a new field for the Board, which you have currently opened. The field instantly becomes available as an option for all cards on the board. Use the pencil icon that belongs to the field to make it mandatory for the cards or to set a default value. To disable a custom field, click the toggle button in the opposite direction. Disabling a custom field removes it from all cards on this board and reset it's settings to workspace's defaults. 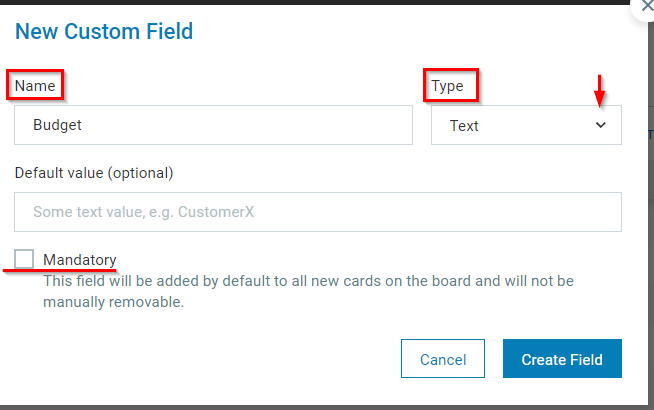 To create a new custom field for that Board -> use the Create custom field button at the top right side of the panel -> enter the new field name (for example: Budget) and select its type (img.2). You can input a default value and make the field mandatory for the cards. When you create the field, it instantly appears in the panel and becomes available in all cards. You can easily re-use it for the rest of the Boards in the Workspace. Workspace Managers can share custom fields between different Workspaces. All shared custom fields in your account are visible in that panel. You can easily see the Workspace from which the field was shared (see Shared From). Just click the toggle button to enable any of the shared fields and make it available for the current board. If you want to share a custom field that you have created, please access the Board settings and open the Custom Field tab (Img.3). Find the field you want to share in the "Fields in Workspace" section-> click the three dots icon -> enable the Edit mode and checkmark the Share between Workspaces Box. These are the system default fields for your account. Users cannot remove or edit them. - Reporter: if you enable this custom field for the board, every time when you create a new card, you will get the card creator in the designated field. - Created at: if you enable this field to the board, every time when you create a new card, you will get the card creation date/time. - Last modified: if you enable this field to the board, every time when you create a new card you will get the last timespan of the card modification. Action: Click the toggle button to enable any of the fields. You can access all available custom fields and the Manage Boards Custom Fields panel from the card Context menu -> Custom Fields. Step 1: Click the Custom field button to get access to all custom fields added to the board. Step 2: See the list of all fields added to the board. Step 3: Select any of the fields to input a value. 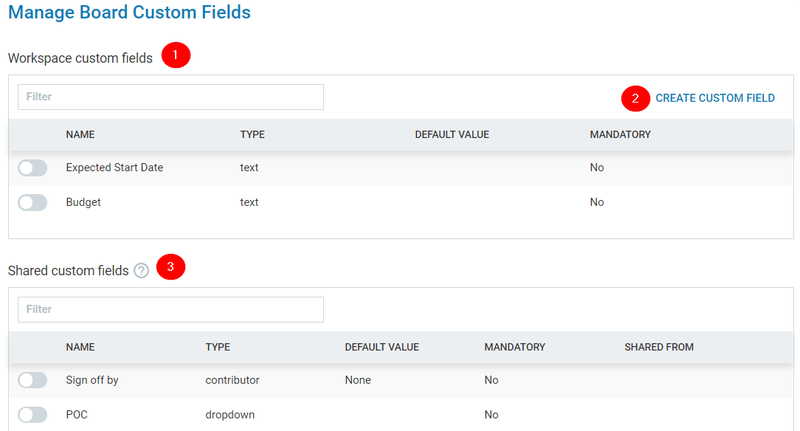 Note: In case that no custom fields have been created/assigned to the board so far, users will be prompted to create a new field or add an existing field from the Workspace settings -> Manage Custom Fields. All custom fields that are not mandatory for the card appear as a choice in the Card Fields menu. Open a card and click the Card fields plus to access and use the Custom Fields. Just click on the custom field and it will be added to the card so that users can fill in the respective value. From this panel, you can also access the Manage Board Custom Field panel. Note 1: If the field is mandatory, it will be instantly displayed on the newly created card and no extra actions are required. 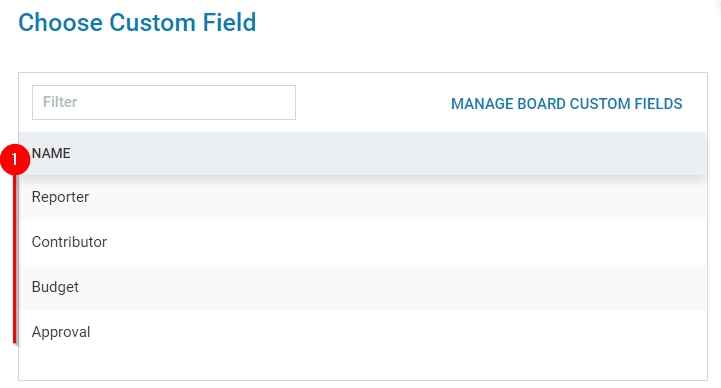 Note 2: If no custom fields have been added to the board, this section will be empty and you need to access either the Manage Board Custom Field panel or the Workspace settings(Manage Custom fields).